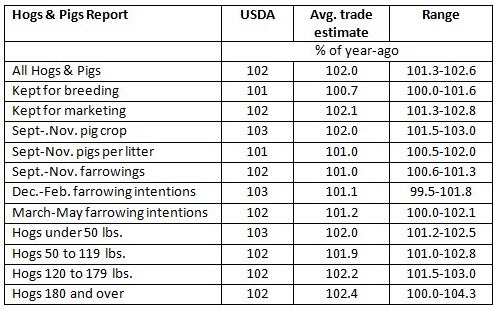 Quarterly hog and pig reports came out this morning as did cold storage. The report came out very close to expectations. All hogs came in at 102% of last year’s levels, we are at 101% breeding levels compared to a year ago while hogs marketed were up 102%. With all of that extra supply, the cold storage showed pork stocks are down from a year ago. Supply in the field is up but product in storage is down, says a lot about demand. We will have a full breakdown of the report on Monday, but our takeaway early is bullish the front end of the curve. The market was thinking we had a wall of pigs in front of us in the short run, the report shows supply is there but not to the level we thought. The amount of bellies in cold storage is key. The report showed 36 million pounds in freezers, we feel that is light and the packer has work to do in the short run to get the number high for the summer, otherwise we could see some good upside price action down the road.